“Built upon a rich tapestry of uniquely Australian samples, Spoonbill has created a modern Australian masterpiece” InTheMix, August 2005. 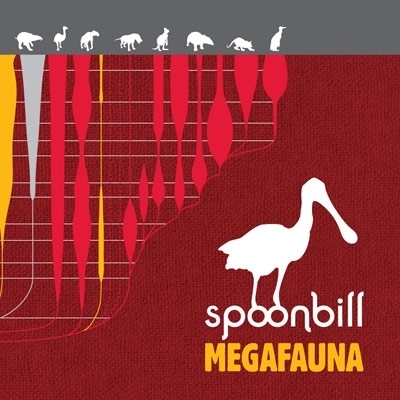 After 2 years of fossicking for samples, making sonic waves in the studio and recording with some of Melbourne’s finest musos, the delightful, genre-bending first offering from Melbourne producer and live electronic performer Spoonbill has finally hatched. Megafauna is an elegant and quirky symphony of honey-scented grooves, jovial humour and joyous beat trickery, melding an ever-evolving array of styles into a distinctive ozzie blend. From its richly textured electronic centre to the live licks around its jazzier edges, Megafauna celebrates and pokes fun at colloquial Australiana. Call it quirk-funk or downbeat with bite, Megafauna takes the listener firmly by the scruff of the ear and leads them into a shady forest of rhodes, horns, and deep double bass, then back out into an eccentric wonderland of glitched-out grooves infused with AM talkback radio and rowdy bush cobbers. On dark nights, you’ll find the Spoonbill and his crew at the wheel of the Mobile Broadcast Unit van, projecting their imagery onto prominent public buildings and crafting spontaneous sound performances in the public domain (www.stembase.com.au/mbu). Behind the bill of the spoon is Jim Moynihan, an accomplished designer who has exhibited sound installation work in Melbourne’s Federation Square, as well as at international design festivals in London and Tokyo. The album has recieved much acclaim throughout Australia and was awarded album of the month on Alchemy SBS Radio and Album packet of the week FBI Radio Sydney. One of the album’s signature tune ‘Gumtree’ won Spoonbill the 1st prize and People‘s Choice award in the 2004 Melbourne Fringe Festival’s Electrovision competition, and is included on the album as a ridiculous cut ‘n’ paste film clip by VJ King Aphid.